PURCHASE, NY: PepsiCo is celebrating successes from its "Crash the Super Bowl" program that featured consumer-generated commercials for both Doritos and Pepsi Max. PURCHASE, NY: PepsiCo is celebrating successes from its "Crash the Super Bowl" program that featured consumer-generated commercials for both Doritos and Pepsi Max. It has also nearly doubled its sales volume for Pepsi Max products since July, when the company launched a marketing activation touting the brand's zero-calorie positioning, said Peter Land, SVP of beverage communications at PepsiCo. Last night, the brands snagged four out of ten top slots on USA Today's ad meter. And with the addition of Pepsi Max, the "Crash" program saw a 50% increase in the level of media activity and social media discussion, compared to pre-event coverage for last year's program which only featured Doritos. Also, entries jumped to 5,600 from 4,000 last year, and its first year expanding voting platforms to Xbox Live and mobile devices triggered a significant increase in voting, explained Chris Kuechenmeister, director of PR for Frito-Lay. For this year's event, the company secured a contract for a total of six consumer-generated Super Bowl spots – three for Pepsi Max and three for Doritos – as part of its “Crash the Super Bowl” program that debuted five years ago. It's the company's most significant Super Bowl activation that includes both a food and beverage brand within the same program, Land told PRWeek in September. The PR and social media investment surrounding Pepsi Max at the Super Bowl was on par with what the company spent on last year's Pepsi Refresh activation during the event, said Land. Last year was the first time in 23 years that the brand eschewed traditional advertising at the event. Leading up to this year's game, the team promoted the brands via joint PR, social media, and signage at retail. The company's Super Bowl efforts, including this year's “Crash” program, an additional Lipton Brisk ad spot, and a Gatorade sponsorship, are indicative of the company's goal to align its corporate brand with its food and beverage products. The company didn't purchase a Gatorade spot this year - last year, it bought a 90-second spot for the pregame show - but it participated in the event as the sole sponsor of the media center, a strategy in line with its goal to target athletes versus traditional fans. 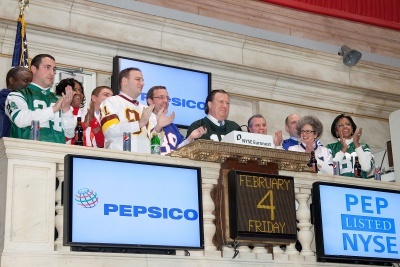 On Friday, an additional pregame effort brought together various PepsiCo brands, such as Mountain Dew, SoBe, and Fritos, for a tailgate party at the New York Stock Exchange. Ketchum led the “Crash” program for both Doritos and Pepsi Max; Edelman supported additional Pepsi Max initiatives around the Super Bowl, such as parties; Olson promoted the Lipton Brisk effort; and Fleishman-Hillard handled the Gatorade program. Ruder Finn supports Mountain Dew and Weber Shandwick supports SoBe.